the most memorable time ever! Obstacle Course Rentals in NC. Your Event is Our Specialty! A bouncehouse rental makes every occasion a smash hit! Our selection includes inflatables for ANY event. 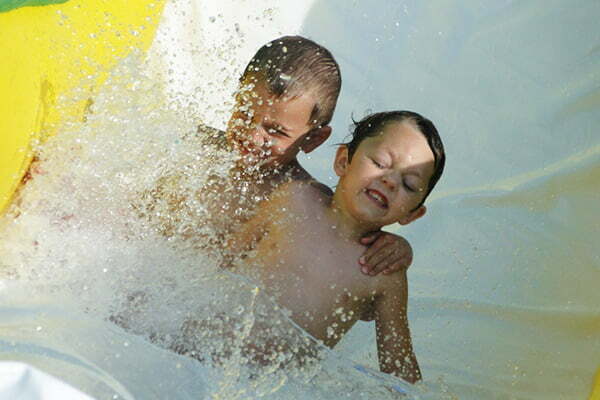 Choose from Obstacle Courses, Water Slides, Bouncehouse with slide Combos, inflatable games, and Outdoor Movie Rentals. Kicks And Giggles USA delivers fun and value. Every customer receives the safest and most reliable bounce house rentals, professional installation/removal, and courteous service. Our inflatables are lead-free, state inspected, and liability insured. As well as all surrounding areas including: Brown Summit, Oak Ridge, Stokesdale, Summerfield, Jamestown, Archdale, Pleasant Garden, Randleman, Liberty, Ramseur, Siler City, Snow Camp, Haw River, Mebane, Elon, Gibsonville, Whitsett. Use the form to the right to send us your reservation request. Keep in mind, this reservation form is a request to check availability for an event date – not an actual confirmation. Complete and submit our reservation request form. We will verify availability for your date, send a quote, or contact you. To book after receiving quote, click “yes I want to book this event” on your quote. We will then email your contract. Once you’ve agreed to terms and paid your deposit ($75 per inflatable), your event is booked! When delivery day arrives, our staff will call en route for your convenience. Your delivery time will be between 8am and an hour before your event start time, depending on our route, or unless other plans are arranged. Mention the item you're interested in here. Kicks and Giggles provides bouncehouse rentals, waterslides, inflatable games, dunk tanks, obstacle courses, toddler inflatables, and all around fun for Greensboro, High Point, Burlington, Winston-Salem, Summerfield, Kernersville, Jamestown, Durham, Oak Ridge, Asheboro, Graham, Chapel Hill, Pleasant Garden, Level Cross, Grays Chapel, Liberty, Julian, Siler City, Snow Camp, Staley, Ramseur, Stokesdale, Eden, Stoneville, Reidsville, Ruffin, Gibsonville, Alamance, Whittsett, Elon, Haw River, Mebane, Randleman, Green Level, Saxaphahaw, Swepsonville, Kimesville and more.